Runners love a challenge – if not, they wouldn’t have taken up the sport in the first place. But beyond, improving speed, fitness and stamina, or taking on longer distances, is a world of different challenges that aim to test an individual to the maximum. So for anyone who thought that running was something of a mundane sport, the following list of 10 of the most unusual routes should be something of an eye-opener. Forget the seven hills of Rome - when it comes to slopes that test the best a runner has, the Scottish capital Edinburgh is more than a match for its Italian equivalent. Taking in iconic spots such as the city’s castle and Arthur’s Seat, the course covers over 14 miles in total and requires a range of disciplines, including both road- and hill-running. The 2011 event is scheduled for June. Raleigh, North Carolina is the venue for the annual event that tests stomach as much as stamina. 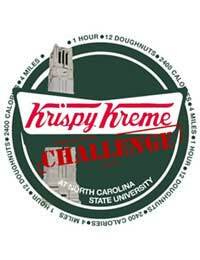 Each runner must complete the two miles from the NC State Belltower to the Krispy Kreme store, consume a dozen of its finest doughnuts, then complete the two-mile return journey, all within one hour. If all this makes you feel a little queasy, then remember that its all in a good cause, proceeds going to the North Carolina Children’s Hospital. For those interested in getting involved in 2011, pencil in February 5 at 8.30am. Hands-up who fancies spending six days running across the Sahara desert? Thought not. However, the reality is that there are plenty of bravehearts out there who are willing to put their body on the line across this 151-mile stretch of Morocco, despite the fact they have to carry everything they need, bar a tent, in a rucksack on their back. March 31 –April 11, 2011 are the relevant dates for those interested in signing up for the next race. Fancy chasing an 8lb Double Gloucester with very little chance of catching it? Plenty of competitors do, vying to take part in one of the five races, the winner of which is the first to cross the line at the bottom. The steepness of the hill in question has contributed to a fair number of injuries down the years. In fact the 2010 event was cancelled, although there is some dispute as to the reasons why. For 2011, May 30 has been pencilled in, although this is still to be confirmed. Panoramic views of high peaks, including Everest, as well as the chance to rub shoulders with yaks, wild ponies and the red panda are what the organisers promise entrants. There is the small matter of negotiating rivers, jungle and forests along the way, though. Designed for middle-distance runners, the five daily stages are split 24, 20, 26, 13 and 17 in terms of mileage. Next year’s event takes place October 16-23. Participants wear a blindfold and are coupled with a sighted companion in this annual event in Boston, Massachusetts that has contributed $1 million-plus to programmes aimed at helping blind and visually impaired individuals. The race, which next takes place on June 11, is based on the middle campus of the city’s college. ‘Animals’ is the theme for the 2011 race run in fancy dress, to be held on September 11. But covering the 26-miles in a silly costume is just the start of the challenge. The real test is the series of wine tasting stations that punctuate the course through the vineyards of one of France’s premier growing regions. For those worried they will wake up with a thumping head to accompany their aching limbs, there are plenty of opportunities to take on water along the way. The inaugural event was held in August 2010 along a one-mile course in Heaton Park, Manchester, and the organisers were encouraged enough to promise there’ll be a repeat in 2011. Those who can’t wait for details to be announced will be glad to know the sport, sometimes referred to as retro running, has devotees around the world, so there may be a competitive event near you during the course of the year. Runners are expected to cover 126 kilometres in 24 hours – challenges don’t come much tougher than that. The payback is the backdrop of some of the most spectacular landscape in the world. If you fancy taking on everything Arizona can throw at you, the important dates are September 19-26, 2011. The inaugural running of the race takes place on March 20, 2011 and offers competitors the opportunity to set foot in three states along the 23.5 kilometre course – Italy, France and Monaco. The azure waters of the Mediterranean should help keep competitors’ minds cool all the way to the finish line on the harbour-side of the principality.